Come limitare l’abuso di cannabis tra i giovani europei di età compresa tra 15-18 anni? According to the European Drug Report 2013 by the European Monitoring Centre for Drugs and Drug Addiction, cannabis use in Europe remains high by historical standards, with a large and relatively robust market existing for this substance, despite some evidence of decreasing trends, especially in countries with a long and established history of high prevalence. Given its status as the most commonly used illicit drug, cannabis is an important issue for prevention work with young people. The implementation of the CAPPYC program aims to learn about young people’s opinions and attitudes regarding cannabis use, and invite them to participate in an educational prevention program which aims to change attitudes favourable towards cannabis use. In terms of the overall European trend, school students’ cannabis use increased between 1995 and 2003, dropped slightly in 2007 and since then has remained stable. During this period, a noticeable trend has been a reduction in cannabis use in many of the countries that reported high levels of prevalence in early surveys. Over the same period, levels of cannabis use among school students increased in many of the countries in central and eastern Europe, showing a degree of convergence across Europe as a whole. An estimated 15.4 million young Europeans (15–34) (11.7% of this age group) used cannabis in the last year, with 9.2 million of these aged 15–24 (14.9%). Cannabis use is generally higher among males. Longer-term trends among young adults are broadly in line with those for students, with gradual increases in use among some lower-prevalence countries, alongside decreases among higher-prevalence countries. There are over 3 million daily cannabis users and the demand for treatment is rising. A significant minority of cannabis users consume the substance intensively. Daily or almost daily cannabis use is defined as use on 20 or more days in the month preceding the survey. Data from 22 countries, suggest that around 1% of adults, at least three million, report using the drug in this way. Over two-thirds of these are aged between 15 and 34 years, and in this age group, over three-quarters are male, all according to the European Drug Report 2013 (OEDT – European Monitoring Centre for Drugs and Drug Addiction). Regarding perceived adverse health effects of cannabis, experts are aware that the drug is not as negatively viewed as cocaine or heroin amongst young people. Therefore, the report reminds us of its harmful effects, such as nausea, impaired coordination and performance, anxiety and symptoms of psychosis. However, such effects can get worse over the long-term and cause respiratory or mental health problems. The study’s main objective is the reduction of expectations and positive attitudes towards cannabis use in young consumers at risk situations, which can lead to a demand reduction for that substance by the implementation (in Portugal, Romania, Spain and Italy) of the selective prevention program CAPPYC (Cannabis Abuse Prevention Program for Young Consumers). The law regarding the use and consumption of marijuana in Italy was first softened by a referendum in 1993, but was then amended by the polemic law n. 49/2006, commonly called Fini-Giovanardi, that toughened the restrictions according to trafficking, production or use, and most importantly, joined together the concepts of soft and hard drugs. Now, a new law has been published on 20 of May of 2014, taking effect on the 21 of May, changing the system of only two tables (one with all kind of drugs, from cannabis to heroin, and another containing medicinal drugs), to a new system that establishes five tables, separating again cannabis from hard drugs like heroin or cocaine. Statistics show that although the use of cannabis among general population is decreasing, it is a reality among youth and even increasing, considering that the use in the last 12 months has been growing from 18,5% in 2010 to 21,56% in 2013. Moreover, cannabis prevalence consumption is directly correlated to the age of the subject, increasing year by year, starting very early in their life and even rising from the 7,8% in the 15 years age range to a 33,9% when they are 19 years old. To be noticed as well is the gender difference in consumption, as female, this step goes from 4,8% to 20%, being a noticeable difference between them. In both sexes, the most common behavior is the occasional use of cannabis, which means that it is consumed from 1 to 5 times per year. 58% of girls do this, and the 50% of boys, while the 30% of boys affirm to smoke 20 or more times during a year with the 18% of girls doing the same. Reporting about risk perception, we can see how Regions and Autonomous Provinces in Italy divide the population in different target groups, selective prevention initiatives depending on personal conditions or the situation of their families. The total number of selective and targeted prevention initiatives which were either on-going or completed by the Regions and Autonomous Provinces are 242 in 2010, which are over twice the number of the previous year, with 107 in 2009. The most common target groups are “Immigrants” and “Young party-goers”, and, then, “Other at-risk subgroups”, “Students with social and/or academic marginalisation problems”, “Young people residing in socially disadvantaged areas” and “Early school leavers”. While by targeting family groups, two-thirds of the projects fall under two specific subcategories, which are “Socially disadvantaged parents” and “Families with substance abuse problems”, being the rest “Families with problems of conflict or abandonment by members”, “Socially disadvantaged parents”, “Families with judicial problems” and other. Also, the way these plans are implemented may vary and are linked to the use of mass media and different resources to get to the audience, like leaflets, internet, magazines, newspapers, TV, posters. Prevention campaigns are as well distributed by matter, like cannabis, opiates, synthetic drugs, cocaine, tobacco, alcohol. There has been a sharp rise in the numbers of Italian students smoking cannabis. It’s the most common drug used by teens in the 15-19 age group. In 2014, 26.7% of students had tried it at least once (up from 24.6% in 2013), while 23.1% said they had smoked cannabis at least once in the past year (up from 21.6% in 2013), and 15.5% claim to have used the drug in the past 30 days (15.2% in 2013). The increase was more marked among girls. However, both sexes make mainly occasional use of the drug, between one to nine times in the past year – 68.2% for girls and 56.5% for boys. With regards to geographical regions and types of school, the survey, part of the annual parliamentary report on the state of drug use in Italy, produced by Italy’s Department for Anti-Drug Policies, the biggest student users of cannabis are in the central regions and go to arts-based institutions and schools. In Italy universal drug prevention activities are routinely implemented in schools (focusing on both licit and illicit substances), however these remain limited to information provision and awareness-raising through lectures and discussions. In the light of the to date existing educational prevention approaches, interactive methods like the CAPPYC Programme become paramount as it introduces the use of technology through audiovisual aid, as considered to be more appealing to students than the traditional methods. In Italy CESIE selected 5 different Secondary School Institutions [#12 different school complexes: 84 classes] and involved 47 teachers/educators that actually implemented the CAPPYC programme in classroom, reaching more than 1600 youngsters (aged 15-18). To ensure a heterogeneous research sample (in terms of gender, socio-cultural background and demographics) the programme in Italy was implemented in different types of secondary schools: Scientific lyceum (upper class), Human Sciences lyceum (mainly female attendees) and Technical institute (lower class and mainly male attendees). Teachers and educators got acknowledged with the content and the methodology of the CAPPYC educational prevention programme during several train-the trainer events to introduce and discuss the ‘Programme TUTORIAL’ – based on the material “Pasa la Vida. Las dos caras del consumo” (Pasa la Vida. The two sides of drug use) created first by Fundaciòn de Ayuda con la Drogadicciòn (2008) [IT|EN]. Next the target group was divided into ‘Study/Experimental Group (SG)’ and ‘Control Group (CG)’. The SG 917 students did benefit from the Programme itself, is supported by 5 audiovisual sessions developed specifically to encourage reflection about the risks and benefits associated with cannabis use; while the Control Group was reintroduced to the process only for the second stage of the consumption assessment and risk perception, once the prevention programme with the SG was already concluded. 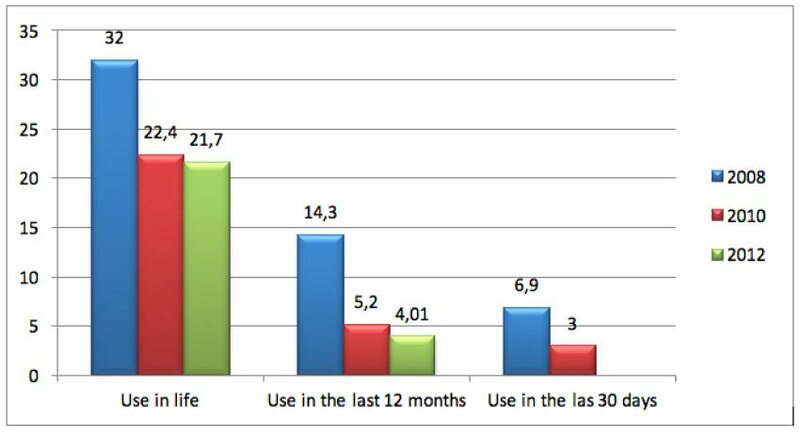 Thus, the CUIQ POST-Questionnaire [1.477 students] aimed at verifying and measure the effectiveness of the prevention intervention and not the percentage of drug consume or abuse per sé. CAPPYC wanted to assess impact of the Pasa la Vida intervention, not the consumption itself. The intervention cycle concluded for the Study Group with an additional satisfaction questionnaire to get a direct feedback from the youth: their level of satisfaction in joining the audiovisual sessions, what they self-assess of having learnt, if it has been interesting and if they consider to be of future use in life. Finally, we asked ‘How would you rank from 1 to 10 your overall satisfaction towards the project?’. The total of responses are well above the arithmetic mean, reaching a 6,61 of satisfaction. Scores from 5 to 10 reached a very positive 72,82%. What did the Italian youth liked the most of CAPPYC? To reflect on the relationships between young people and adults. To reflect on the relationship they will have with cannabis in the future. To reflect and question the expectations that young people have in relation to the use of cannabis. Often the youth have concluded the sessions talking about drug trafficking and international mafia, that is a well-known hot topic in Italian society. Therefore the linguistic and cultural adaptation of the programme’s videos and learning material was definitely an added value of the project and ensured the respect of European societies peculiarities and mutual understanding at partnership, European level. The proposed learning/prevention objectives sparked a number of questions, as it occurred also to tackle deep conflicts and unease situations regarding different aspects of some students’ personal life conditions and family situations. Teachers refer that the videos were followed with widespread attention by most students as the subject was very interesting for all. The discussions in class were lively and continued also out of classroom setting. From the educators’ feedback the CAPPYC intervention was relevant and motivating foremost in terms of innovation in methodology as in Italy, as mentioned, universal drug prevention activities are routinely implemented in schools but remaining limited to information provision and awareness-raising through lectures and discussions. Some of involved schools said to be willing to independently repeat the prevention initiatives in the following years. Finally, we would herby like to thank the Palermitan Schools for their availability and kind cooperation: Istituto Magistrale Regina Margherita, Liceo Scientifico Benedetto Croce, Educandato Statale Maria Adelaide, Liceo Classico Vittorio Emanuele II, Istituto Tecnico Trasporti e Logistica Nautico Gioeni Trabia). a projection of our consciousness where to relieve our problems. The Partnership offers the CAPPYC material free of charge (all material is available for download in English, Spanish, Portuguese, Rumanian and Italian language), with no copyright restriction, in the hope that it will prove useful to prevention educators of formal and non-formal education all over Europe. Presidency of the Council of Ministers – Department for Anti-Drug Policies: Annual parliamentary report on the state of drug use in Italy 2015. The planning and implementation of prevention activities in Italy are mainly the responsibility of the regional and autonomous provinces; however, the Department for Anti-Drug Policies at the Presidency of the Council of Ministers provides part of its annual budget to support universal and selective prevention activities. 2011 National Report (2010 data) to the EMCDDA by the Reitox Italian Focal Point. Italy, 2011.